Russia's foreign minister Sergey Lavrov has condemned a news report of witnesses’ statements, in which people said they had seen a rocket fired at the time of Malaysian Boeing crash in Ukraine in July 2014. "Looks like a stovepiping," Lavrov said. “[There are] some witnesses, who contradict one another, and express things amusing for any specialist. For instance, some wiggling rocket, separating rocket stages, blue clouds of smoke,” the minister said, adding such information has been provided by alleged eyewitnesses, who managed to see the crash despite being 25 kilometers (15 miles) away from it, in cloudy weather. “Nor could they shed light on a contention of officials in Kiev and in Western states, that the BUK missile battery was brought in from Russia and was operated by a Russian crew,” Reuters reported. 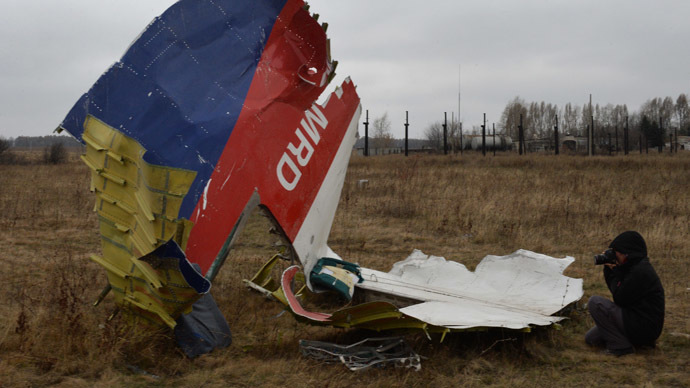 READ MORE: Malaysia excluded from MH17 probe – for 'not pointing fingers at Russia'? Russia closely follows the investigation and examines any facts that could shed light on it and help determine the identities of those who were in charge, Lavrov said at a press-conference in Moscow. “We call for an objective, unbiased, professional examination of each and all facts and versions, and consider it unacceptable for anyone to assume that they have a monopoly on truth before such investigation finishes,” the minister said. There have been a number of other witnesses’ reports, “recorded on camera,” Lavrov reminded reporters, saying that such evidence has been dismissed both by Western counterparts and the media. Citing witnesses who saw a fighter jet flying at the time of the crash, and reports of a person who worked at a Ukrainian military base who said one of the jets “returned there without one rocket,” Lavrov said opposing accounts have not been given deserved attention. Questions posed by Russia’s defense ministry remain unanswered, the foreign minister added, saying there are still no promised images from American satellites or recordings of Ukrainian air traffic controllers’ communications with the plane and other aircraft at the time of the crash. “I have no hope of getting answers to these questions any more,” Lavrov said, adding that Russia will continue to study all available information to get to the truth of what happened to MH17 flight. With an official investigation into the crash dragging on for months, Moscow has criticized the slow process that doesn't provide much information several times before, and called for a more proper and open probe. Despite all the hype around the crash, the investigators do not seem to be in a hurry, Russian FM has previously said. The Malaysia Airlines Boeing 777 was en route from Amsterdam to Kuala Lumpur when it was allegedly taken down over Ukraine, killing all 298 people on board. The investigation of the crash is led by the Netherlands, as the majority of its victims were Dutch. Anti-government militia in eastern Ukraine have been largely blamed by Kiev and its western allies for shooting down the airliner, with the use of a Russian-made BUK anti-aircraft missile system. While the rebels have been denying their involvement in the crash, the Russian Defense Ministry has published radar data pointing to other possibilities, including an attack by a Ukrainian fighter jet as the cause of the tragedy. The official also questioned pictures of an alleged parts of Russian BUK damage elements, reportedly found during the investigation. He said that elements on the released pictures could have been parts of BUK modifications owned by the Ukrainian army, with Russian BUKs having different types of these elements. He expressed hopes for a “more professional” investigation.